In order to play Far Cry New Dawn, your PC should have the minimum requirement of it to play or run properly. If not, then your PC will end up lagging or stuck at loading. And that’s you probably don’t want to happen. If you love playing games and you haven’t played tons of game on your PC then one awesome advise I want to give you today; check the minimum PC requirement of the game you are about to play on your PC. It’s very important because if the game requirement fails to match, your PC may get into risk. Like your PC may die or fail due to heavy load. 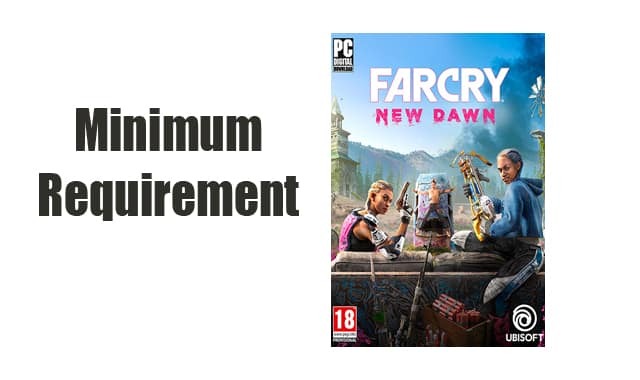 So, checking the PC Requirement (minimum) is a must before playing any game on PC. In today’s article, I will show you the PC requirement of Far Cry new dawn which has just released for various consoles and PC. Let me first clarify why requirement matters. 0.1 Why your PC should Match the PC requirement (minimum at least) of Far Cry New Dawn? Why your PC should Match the PC requirement (minimum at least) of Far Cry New Dawn? Your PC at least need the minimum of its Requirement in order to Run Far Cry new dawn properly. If your PC doesn’t have the minimum requirement of Far Cry new dawn and you still running it then your PC is under risk. However, once the load on PC get double or triple than usual due to the unmatch requirement, chances some hardware will fail or stop working. Hardware like RAM, CPU Processor, Graphics card, etc. Its happened with my PC almost three times. RAM is very sensitive hardware in PC that usually stops working when load increases on it. So, if you want to be safe from these hardware failures then I highly recommend having the minimum requirement on your PC before you play or start the game. Now, let me first show you the minimum and recommended Requirement of Far Cry New Dawn for PC. Unfortunately, Far Cry New Dawn only works in 64-bit so, if you are using a 32-bit operating system and want to play it then you should jump to 64-bit OS. I highly recommend installing a 64-bit OS on your PC because all the modern PC game will only be going to work in 64-bit. And it’s normal because 64-bit is more capable than 32-bit in handling complex processing. Now, let me show you the Recommended PC requirement of Far Cry New Dawn. 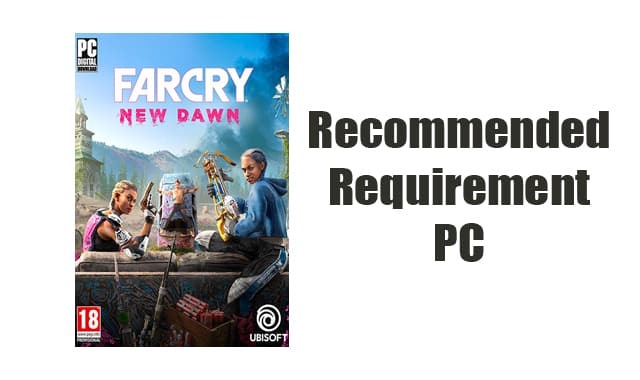 You will be able to play Far Cry New Dawn game in your PC if the recommended requirement installed. So, these two types of Requirement has released for Far Cry New Dawn. If you got the minimum Requirement on your PC then you can easily run it and if you have got the Recommended one, no caption. Let’s differentiate both of the requirements. The only difference has in both of the Requirement of Far Cry New Dawn is Graphics and Processor. The minimum Requirement has CPU; Intel Core i5-2400 | AMD FX-6350 3.9 GHz whereas, Recommended has CPU; Intel Core i7-4790 3.4 GHz | AMD Ryzen 5 1600 3.2 GHz. It’s a huge difference. Now, let’s see the difference in Graphics. The minimum Graphics requirement of Far Cry New Dawn; NVIDIA GeForce GTX 670 | AMD R9 270 with 2GB VRAM. Recommend Graphics of Far Cry New Dawn; NVIDIA GeForce GTX 970 | AMD R9 290X with 4GB VRAM. That’s the only difference between both the requirements of Far Cry New Dawn. For running the Far Cry New Dawn on PC, it must have the minimum Requirement that you can see from above. Still, it may not enough if you have the minimum requirement because the heating and hardware failure chance is still there. But if you have got the recommended requirement on your PC then you don’t need to worry about anything instead leveling up in the Far Cry New Dawn. Hopefully, you liked this information about Far Cry New Dawn. If so, please share it with your friends and let them know the requirements of Far Cry New Dawn for PC.